NASA astronauts on the International Space Station will use this ForceShoe to help scientists on the ground monitor their exercise. A new pair of running shoes may help you run a personal best, but a different kind of shoe could help spacefarers stay fit. The shoes, which will be worn by astronauts in space, may help scientists on the ground learn more about how the body responds to weightlessness on the International Space Station. NASA officials sent a device called the ForceShoe to the space station in May so astronauts can literally put it through its paces. Space station occupants will wear the shoes during some of their exercises, so that researchers can learn more about how the body's joints behave in microgravity. A person uses the ForceShoe on Earth before it launched to the International Space Station in late May 2014. "Although [the ARED] has helped NASA provide better health outcomes for crew members, there is still progress to be made in understanding the effects of exercise on bone and muscle health, and the ForceShoe will help us do that," Andrea Hanson, space station exercise hardware specialist, said in a NASA statement. Similar force-shoe technology has been used before, but only on Earth. "We are eager to understand how joint forces may be different between exercise performed on the ground and in space, and force-shoe technology might help us do this in future investigations," Hanson added. The ForceShoes, developed by the 3D motion tracking company Xsens, look like electronically enhanced sandals and measure forces along three axes: up and down, front to back and side to side. Two to four astronauts will wear the shoes, first during static and then during dynamic exercises. In the static exercises, astronauts will set the ARED to a predetermined load and then lift the exercise bar. This procedure will confirm that the shoes work as well in low gravity as they do on Earth. Once researchers have confirmed the shoes' effectiveness, astronauts will wear the devices during exercises that include squats, bicep curls and deadlifts. Data will be transferred by Bluetooth to space station computers, and then, a few days later, to NASA computers on Earth. 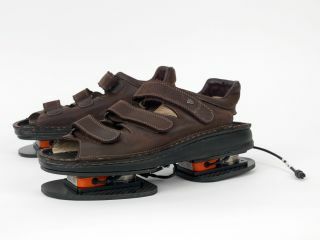 The data gathered by the shoes will help NASA refine the exercises that astronauts perform, making them more efficient. The more-efficient exercises will help astronauts more easily maintain bone and muscle strength during long space flights to other planets.